It's remarkable to see the Martha Graham Dance Company standing relatively strong, 92 years after its founding. It has survived the death of its founder, an ensuing legal battle over her creative output, moving its headquarters, then flooding which destroyed much of its costumes and sets, and the inexorable company turnover as time moves on. Yet at City Center on April 11, as part of Sacred/Profane, the company and its supporters gathered to celebrate its survival, and indeed growth, albeit as a limb off of a big trunk. So often Graham's classic works are accompanied by taped music, and the recordings tend to sound tinny and worn, old as they are. So it was a pleasure that the opening performance of Embattled Garden was elevated by the use of live music, written by Carlos Surinach, and performed by the Mannes Orchestra. Noguchi's sets remain singularly sculptural and functional; here the downstage piece becomes a safe harbor and a lookout point, the upstage the pseudonymous garden of Eden. The young cast of four (Anne O'Donnell, Lloyd Knight, Leslie Andrea Williams, and Lorenzo Pagano) was well-balanced; the men look as strong as the women, who in this company have often drawn the gaze. 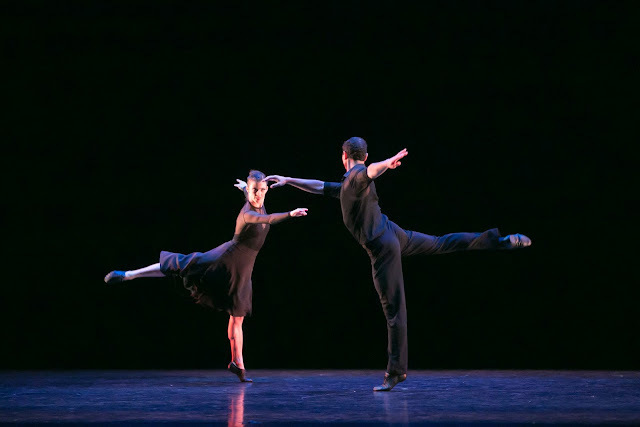 Three other couples, in grey, populate the stage; the couples' interactions are more physical and in keeping with how tango is usually done. But there is tension between the passionate, warm music and the rectilinear, formal attitude of Childs' choreography. In a sense, this sense of tension is not unlike when you watch traditional tango, in which sensuality simmers beneath a social veneer. Lar Lubovitch was awarded the Martha Graham Award, which, as Artistic Director Janet Eilber joked in a brief onstage presentation, Graham would never give to another choreographer while she was alive. Lubovitch created The Legend of Ten to Brahms' Quintet for Piano and Strings in F minor. In the first sections, the choreographer's signature fluid, looping movement is on full display; a repeating hook features the dancers tap-stepping and rolling their heads side to side, arms rippling softly. They form various patterns, shapes, and tableaus, which Lubovitch excels at. In the work's later movements, the dynamic becomes more percussive. Folk steps strengthen the sense of community. 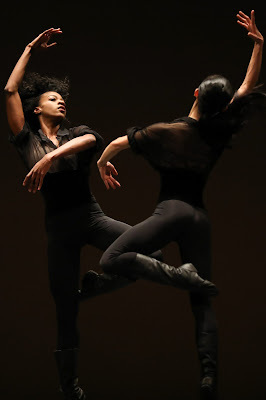 The dancers face inward, form a circle, and hold hands, stomping and kicking their legs back. They gesture as if strewing seeds, and mock clap and stamp their feet, cossack-style. This sense is underscored by their elegant boots; all genders wear the same elegant blouses, tights, and obi costumes in pewter, designed by L. Isaac with Naomi Luppescu. No one can match Lubovitch in creating beautiful, seamless movement. The shift in Legend from this pure beauty into a version of a functioning group, be they workers or soldiers, provides some welcome narrative structure. Incidentally, the Lar Lubovitch Dance Company will perform at the Joyce next week and celebrate its relatively young 50th season; the Graham dancers will dance Legend of Ten in a guest spot.